Hi Everyone! Books-n-Kisses and I thought it would be fun to learn what are some of the narrator's favorite reasons for being an audio book narrator! Today, we have the pleasure of sharing with you one of my favorite narrator's Top 5 Favorite Things About Being An Audio Book Narrator. Please allow me to introduce you to Iggy Toma! Curious to learn more? 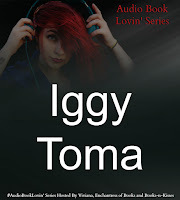 Visit last year's Audio Book Lovin Interview with Iggy Toma!